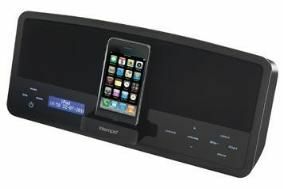 Intempo revamps its iPod DAB/FM speaker dock | What Hi-Fi? There's a fully functional touchscreen on the device as well as increased power output under the shell, now delivering 50 watts. An alarm with snooze functionality is included, there are radio presets for your favourite stations, an auxiliary input for connecting other music players, plus headphone and video outputs. Available from Argos, Amazon, Comet, Makro and Best Buy, it's yours for £150.